The North West Provinces in 1837, the year that Muir arrived there. Sir William Muir, KCSI (April 27, 1819 – July 11, 1905) was born in Scotland where he ended his career as Principal and Vice-Chancellor of Edinburgh University, after serving in India from 1837 until 1876. Following a series of junior appointments, he became Secretary to the Government of the North West Provinces in 1852, a middle-ranking post. During the First War of Indian Independence he distinguished himself as head of the intelligence service, operating from the Agra Fort where the British had taken refuge. Senior posts followed. In 1865, he was appointed foreign secretary to the Indian Government in Delhi. Knighted in 1867, he became Lieutenant-Governor of the North West Provinces in 1868, where he remained for an extended period in office until 1874. He then returned to Delhi as financial minister. Leaving India in 1876, he sat on the Council of India in London. Elected Principal and Vice-Chancellor of Edinburgh University in 1885, he retired for the second and last time in 1903. Muir's legacy lives on in the strong tradition of South Asian and Islamic Studies which he and his brother, John, did much to establish at Edinburgh. In addition to his career as a civil servant and University administrator, Muir made a valuable contribution to scholarship. In recognition, he was awarded five honorary doctorates from prestigious universities and a prize from the Royal Asiatic Society, of which he was president in 1884. A strong supporter of Christian missionary work, he was also a Vice-President of the Church Missionary Society. His writing on Islam pioneered, in the English-speaking world, use of some of the earliest sources. He contributed significantly to the chronological reconstruction of the life of Muhammad and of the history of Islam, although his negative attitude towards Islam and Muslims permeates his work. Alongside his scholarly writing, Muir also wrote apologetic and missionary tracts. The conviction that his faith was the only true faith colors his writing. On the one hand, he enjoyed genuine friendships with Muslims and admired aspects of Arab culture; on the other hand, he could not bring himself to recognize anything of value in Islam. He saw Islam as a foe to be defeated. Since Christianity contained the whole truth, there could be no truth in Islam. For some, the ultimate truth about God is beyond human grasp, They suggest that other religions also contain truths, which complement, challenge, critique and even sometimes cause us to change our beliefs. Muir did not penetrate to Islam's inner, spiritual depth. He remained on the outside, looking in, despite his considerable knowledge. He saw no depth. He was unable to see Muslims as spiritually alive. Nonetheless, the importance of Muir's contribution to the development of Islamic studies in the Western academy cannot be overstated. He was born at Glasgow, the son of a merchant, William Muir and of Helen nee Macfie. The senior William died in 1820, after which Anne moved the family to Kilmarnock. William attended the local Academy followed by Glasgow and Edinburgh Universities. However, before he could graduate an uncle of his mother, Sir James Shaw secured a writership for him with the British East India Company where three brothers, John, James, and Mungo were already serving. Sir James had secured employment for all the brothers. James and Mungo died shortly after reaching India. After some time at Haileybury College, then the Company's training school, Muir departed for India. 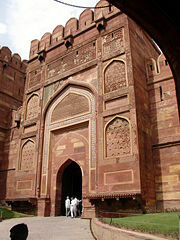 A gate to the inside of Agra Fort, where Muir and his family took refuge during the revolt of 1857-1858. Reaching India in 1837, he was stationed in the North West Provinces. He maintained a close association with NWP for the rest of his career, although he was also for several years based in Delhi. Initially, he occupied a series of junior posts. He was not as obviously ambitious as were some of his peers and did not insinuate himself with his superiors. On the other hand, he was diligent and conscientious and earned a reputation for unassuming efficiency. By 1840 he had married Elizabeth Huntley, daughter of the Collector (District Administrator) of Cawnpore and by 1847 he was secretary to board of revenue of the North West Provinces based in Agra. In 1852 he became secretary to the Lt. Governor, James Thompson. Thompson and Muir were both evangelical Anglicans who supported the work of the Church Missionary Society. Muir held office in the local CMS Association. John, his surviving brother, was establishing a reputation as a scholar of Sanskrit and of Hindu literature. William began to develop an interest in the study of Islam, largely to assist with polemic and to aid missionary outreach. In early 1850s he reported on the correspondence between Karl Gottlieb Pfander the German-born CMS missionary and the Muslim scholar, al-Kairanawi. He described these debates in articles published by the Calcutta Review, also summarizing the recent history of Christian mission to Muslims and reviewing relevant literature. These articles were later published as The Mohammedan Controversy (1897). In 1854, he observed the public debate between these two, although after this encounter he did not write a report. Responding to Pfander's call for a reliable account of the life of Muhammad, however, he began serious and detailed work on a biography. He learned Arabic and Persian. During the First War of Indian Independence, called at the time the "Mutiny" he and his family, with other British residents, took refuge in the Agra Fort. The Muirs' five children were with them in the Fort (several children had already died). Muir was placed in charge of the intelligence department, later publishing Records of the Intelligence Department of the North-West Provinces of India during the mutiny of 1857, (1902) in which he describes how his agents passed through enemy lines with hidden messages. "The Muslims," he wrote, "defied our government in the most insolent manner." "All the ancient feelings" he continued "of warring for the faith reminding one of the days of the first caliph were resurrected." The same passage says that those taking part were promised immediate entry to paradise. It was also during the siege that he proof-read the first volumes of his originally four volume Life of Mahomet (1858-1862). Later editions would appear in 1878, 1894 and an abridgement, still in print, edited and revised by Thomas Hunter Weir, in 1912. During the siege, he and his family gave house room to the future bishop of Lahore, Thomas Valpy French. French had acted as one of Pfander's seconds during the Agra debate. One of Muir's first acts after the end of the conflict was to make sure that one of his precious manuscripts of any early life of Muhammad was safe. In 1865, he was appointed foreign secretary to the Indian Government. Sir Syed Ahmad Khan, Muir's friend and colleague. In 1867 he was created a Knight Commander of the Star of India, and in 1868 he became lieutenant-governor of the North-West Provinces. He is said to have been passed over for this post when it had been vacant in 1864 but subsequently he became a close friend of the Governor-General, John Lawrence and once appointed his incumbency was extended because under his administration the region remained stable. As Lt-Governor, Muir was a strong advocate of education, encouraging female education. His speeches frequently refer to the benefits of female education. At the time, women in the United Kingdom had very limited access to this as well. 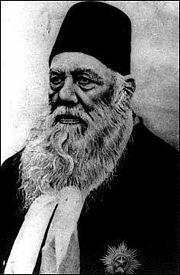 Although his writing on Islam expressed a highly critical evaluation and attitude towards his subject, he enjoyed personal friendship with eminent Muslims, including Sir Syed Ahmad Khan, a member of the judicial service in NWP who had remained loyal to the British during the conflict. Muir became the official visitor of Khan's Anglo-Mohammedan Oriental College, later Aligarh Muslim University. Muir was also a friend of the Muslim ruler of Rampur. Muir himself founded Muir Central College in 1873. In 1887, this became the University of Allahabad, the fourth oldest in India. In 1876, Muir's speeches and addresses as Lt-Governor were published as Addresses Made in the North-West Provinces. Muir tried but failed to restore Persian as an official medium of instruction alongside English. Pottinger describes Muir as an "efficient and acceptable ruler of the North West Provinces, always alert to watch lest conditions of partial scarcity should deteriorate into full-scale famine, to protect the peasantry from famine and to maintain the rule of law in his troubled province." Muir's attitude towards Indian was often paternalistic but he did see his duty in India as doing "good" not exploiting and accumulating wealth. What, he asked were "Englishmen in India for?" His reply was, "that we should raise and elevate the people, make them the happier and better for our being here." Muir served from 1874 until 1876 as financial member of the Governor-General's Council. Membership of the Council was regarded as the zenith of a career in the Indian Civil Service. Muir dissented from the Governor-General's policy in Afghanistan on the grounds that the king had every right to refuse to accept a British mission. A very costly war resulted from the Governor-General's insistence on interfering in the region and to the murder of the British Resident in Kabul. Muir's dissent may have cost him the Governor-Generalship although it has been claimed that he turned this down. Retiring in 1876, he became a member of the Council of India in London. Old College, Edinburgh as it was before the Dome was added in 1887, two years after Muir's term began. In 1885 he was elected principal of Edinburgh University in succession to Sir Alexander Grant and the 22nd since the University's foundation. In Edinburgh, he joined his brother, John who had retired with a distinguished record from India in 1853, honored with the CIE. Among other posts, John had served as Principal of Victoria College, Varanasi. At Edinburgh, he endowed the Shaw Fellowship in mental Philosophy in honor of Sir James Shaw. John and William endowed various prizes and chairs in the field of Oriental studies including the Chair of Sanskrit in 1862, nominating the first professor. It later became a Regis Chair. John, as had Muir, was largely self-taught but received academic recognition from several Universities. Both were honored by the naming of the Muir Institute to commemorate their contribution to the University. In his inaugural address, Muir praised an Indian student, Prafulla Chandra Roy, who had submitted an entry for competition to write the best essay on India before and after the "mutiny." Although Roy's went on to complete his doctorate at Edinburgh. Highly critical of the British, Roy’s essay, which did not win but attracted Muir's attention, was also humorous. It was later published. Roy became a leading scientist in India. Always taking an interest in the student life, athletics and welfare. Muir was dubbed the "students' principal" and did much to strengthen the Student Union. Mcewan Hall, where graduations take place, was built during his principalship. Muir's inaugural address was entitled, "The Lord's Supper an Abiding Witness to the Death of Christ." On April 14, 1899 it fell to him as part of his duties to confer an honorary doctorate on his son-in-law, Major General Andrew Gilbert Wauchope, who had married his daughter Jane. Muir was always a prolific writer. Now, a series of both scholarly and more popular books and tracts, some of which were translations of works of Christian apology, flowed from his pen. Most notably, he produced an abridged translation of the Apology al Al-Kindy (1882) the Annals of the early Caliphate from original sources (1883) followed by The Caliphate: Its Rise, Decline and Fall (1891) also later revised and edited by Weir (1915) and still in print, and his Reed Lectures, delivered in 1888 as the Rede Lectures at University of Cambridge, in many respects the continuation of his Life of Muhammad. His 1896 history of the Mamluks of Egypt is also still in print. He translated William St-Clair Tisdall's The Sources of Islam, A Persian Treatise in 1901. Tisdall was awarded the Edinburgh DD while Muir was Principal. He retired as principal in 1903. Muir is credited with recommending "Kaiser-i-Hind" to Queen Victoria as the Indian form of her title Empress of India, and to have assisted her with her study of Indian languages while a guest at Balmoral. Muir wrote several apologetic tracts and remained active as a supporter of missionary work until his death. He served on the boards of several mission organization including the Turkish Mission Aid Society and the Church Missionary Society. He was a vice-president of the CMS from 1877. In addition to his knighthood, Muir was awarded honorary doctorates from Cambridge, Edinburgh, Glasgow, Oxford and Bologna, where he represented Edinburgh at the University's eighth centennial celebration. In 1884, Muir was elected President of the Royal Asiatic Society, of which he was elected a Fellow in 1877. He was Vice-President 1985-1986 and from 1894 to 1897. In 1903 he was honored with the centennial gold medal. There is a statue of Muir in the Great Hall at Muir Central College and also in Edinburgh University (by Charles McBryde) . Elizabeth and William had five sons and six daughters; four of his sons served in India, and one of them, Colonel A. M. Muir (d. 1899), was Political Officer for South Baluchistan, and was acting British Resident in Nepal when he died. Elizabeth died in 1897. Muir died on July 11, 1905. He was buried in Dean cemetery. Muir's Life of Muhammad and history of the caliphate have been described by one of the twentieth centuries leading scholars of Islam and of the Middle East as "still not quite superseded." In his use of original and early sources to reconstruct the chronology of Islam and the life of Muhammad, his work was pioneering in English although he acknowledged a debt to several German scholars, such as Gustav Weil. His attempt to date events is useful, since it not always clear from the sources when events took place. William Montgomery Watt, another leading twentieth century scholar and distinguished biographer of the prophet, describes Muir's life as "following in detail the standard Muslim accounts, though not uncritically." Watt also commends Muir's description and evaluation of the available sources for historical reconstruction. Muir donated his manuscript sources to the India Office Library. Muir was not an objective scholar, although he offered his Life of Mahomet and later histories as serious scholarly work. He depicted Muhammad as initially sincere, as a searcher for truth but says that he later began to fabricate revelation to serve his own personal and political agenda. "Mahomet," said Muir was "By whatever deceptive process, led to the high blasphemy of forging the name of God … Thenceforward he spoke literally in the name of the Lord." Muir singles out incidents in Muhammad's life, such as his multiple marriages, some incidents when enemies were allegedly assassinated and especially what he called the "Satanic Verses." This refers to a tradition that when Muhammad recited Surah 53 verses 19-23, which refer to three of the pagan goddesses as "but names," Satan, who always tries to pervert revelation, instead the words that they were exalted cranes, whose intercession could be sought. Following his lengthy description of this so-called "compromise" with monotheism, or "concession," Muir surmises that if Muhammad was Satanically inspired once, perhaps he was always Satan's mouthpiece? Muir had it that Muhammad was prone to some type of melancholy or sickness and that light constantly struggled with darkness in his mind. Muir posited a moral declension; Muhammad was initially close to accepting Christianity but parted company from Christians and Jews when they refused to accept his message. Muir used Muslim sources but did not think to ask Muslims how they understand the events he considered morally reprehensible, since they read the same material. He concluded that Islam stifles freedom, retards social progress and represents a threat to civilization itself. The sword was used to silence dissent. On the one hand, he spoke of many of the pious traditions about Muhammad as forged. Perverted traditions were the chief tool used to justify any position. Muhammad had even permitted deceit. On the other hand, he thought that the historical material was much more reliable. Muir saw the Qur'an as a composite work borrowing from Jewish, Christian, and pagan sources. However, his effort to relate the life of Muhammad to specific Qur'anic passages is a useful contribution to content-context analysis, although what has been called the original order of the Qur'an cannot be precisely determined. Muir's work also stimulated others to attempt to write a life of Muhammad, or to discuss some of the issues raised by his critique. His own friend and colleague, Syed Ahmed Khan, expressed both praise and criticism for Muir's Life in his own A Series of Essays on the Life of Mohammed, And Subjects Subsidiary Thereto (1870) for which he could find no publisher and so paid for the printing himself. Muir's book was the best available by a non-Muslim but Muir's shortcoming was that he good see nothing beautiful at all in Muhammad. Syyed Ameer Ali, another Muslim writer of this era was less flattering, calling Muir an "avowed enemy" of Islam. Books by Clinton Bennett and Jabal Buaben discuss Muir's legacy in detail. Muir's legacy also lives on in the tradition of South Asian studies at Edinburgh University, which he helped to establish. By editing the negative commentary from his work, subsequent writers have built on Muir's scholarship to produce less biased accounts of Muhammad. Muir faced what any non-Muslim writing about Muhammad experiences; if a writer does not believe that Muhammad was inspired by God and received the whole content of the Qur'an entirely from God, he or she has to explain how the Qur'an was compiled. Either Muhammad wrote it, or it is a much more composite work, perhaps compiled over a longer period of time, as some argue. A person like Muir, who was deeply committed to his own faith, found a more sinister explanation attractive. Others adopt the strategy of giving priority to Muslims opinion, which they present without comment. Yet non-Muslims who write about Islam are entitled to their opinions; for some critics, no religion has any link with God because they reject God's existence. Muir was known throughout his life for piety and for consistent moral behavior, as one writer put it. ↑ William Muir, and W. Coldstream. 1902. Records of the Intelligence Department of the North-West Provinces of India during the mutiny of 1857, including correspondence with the supreme government, Delhi, Cawnpore, and other places. (Edinburgh, UK: Clark, 1902), 46. ↑ This was the senior post in the NWP, directly responsible to the Governor-General. ↑ William Muir, 1876, Addresses made in the north-west provinces. (Simla, INDIA: Governmental Central Branch Press), 6,8,13,30,35,41, 51-52. ↑ University of Allahabad. Universities in Uttar Pradesh. Retrieved February 25, 2009. ↑ George Pottinger. 2007. Mayo, Disraeli's Viceroy. (Salisbury, UK: Michael Russell. ISBN 9780859551649), 78. ↑ Companion of the Indian Empire. ↑ John Muir received honorary doctorates from Oxford University, Edinburgh and Bonn. ↑ George Smith, "Muir, William." 659-661 in Dictionary of National Biography, 2nd Supplement. Volume 2. (Oxford, UK: Oxford University Press, 1912), 660. ↑ Albert Habib Hourani. 1980. Europe and the Middle East. (London, UK: Macmillan Press. ISBN 9780333269480), 34. ↑ W. Montgomery Watt. 1961 Muḥammad: prophet and statesman. (London, UK: Oxford University Press. ISBN 9780198810780), 244. ↑ Muir, 1858, Volume 2, 150-160. ↑ Syed Ahmed Khan. 1870. A Series of Essays on the Life of Mohammed, And Subjects Subsidiary Thereto. (London, UK: Trubner & Co., 1870, reprinted by Lahore: Premier Book House, 1968. ASIN: B0006C2956 (in English), xvii. ↑ Syyed Ameer Ali, 1891, 211. ↑ Church Missionary Society. 1874. The Church missionary gleaner. (London, UK: Church Missionary Society), 65. Ali, Sayyid Ameer. (1891). The Spirit of Islam. London, UK: W.H. Allen. reprint of Syed Ameer Ali. 1922 ed. Kessinger Publishing, LLC, 2003.
al-Kindī, ʻAbd al-Masīḥ ibn Isḥāq, ʻAbd Allāh ibn Ismāʻīl al-Hāshimī, and William Muir. 1882. The apology of Al Kindy: written at the court of Al Mâmûn (A.H.215;A.D.830) in defence of Christianity against Islam. London, UK: Smith, Elder. Bennett, Clinton. 1992. Victorian Images of Islam. London, UK: Grey Seal. ISBN 9781856400282. Buaben, Jabal Muhammad. 1996. Image of the prophet Muḥammad in the West: a study of Muir, Margoliouth and Watt. Leicester, UK: Islamic Foundation. ISBN 9780860372608. Hourani, Albert Habib. 1980. Europe and the Middle East. London, UK: Macmillan Press. ISBN 9780333269480. Muir, W., & Coldstream, W. 1902. Records of the Intelligence Department of the North-West Provinces of India during the mutiny of 1857, including correspondence with the supreme government, Delhi, Cawnpore, and other places. Edinburgh, UK: Clark. Muir, William, and T.H. Weir. 1912. The life of Moḥammad from original sources. Edinburgh, UK: J. Grant. Muir, William, and T.H. Weir. 1915. The Caliphate: its rise, decline, and fall: from original sources. Edinburgh, UK: John Grant. Muir, William. 1852-1862. The Life of Mahomet from original sources. London, UK: Smith & Elder. Muir, William. 1876. Addresses made in the north-west provinces. Simla, IN: Governmental Central Branch Press. Muir, William. 1883. Annals of the early Caliphate, from original sources. London, UK: Smith, Elder & Co.
Muir, William. 1891. The Caliphate: Its rise, decline, and fall ; From orig. sources. London, UK: The Religious Tract Soc. Muir, William. 1897. The Mohammedan controversy; biographies of Mohammed, Sprenger on tradition, The Indian liturgy, and The Psalter. Edinburgh, UK: T. & T. Clark. reprint ed. Hesperides Press, 2006. ISBN 1406736740. Muir, William. 1975. The Caliphate: its rise, decline, and fall; from orig. sources. New York, NY: AMS Press. ISBN 9780404563059. Muir, William. 2003. Life of Mahomet: from original sources. Delhi, IN: Voice Of India. ISBN 9788185990767. Muir, William. 2007. The Mameluke or slave dynasty of Egypt, 1260-1517 Piscataway, NJ: Gorgias Press. ISBN 9781593336974. Pottinger, George. 2007. Mayo, Disraeli's Viceroy. Salisbury, UK: Michael Russell. ISBN 9780859551649. Smith, George. 1912. "Muir, William." 659-661 in 1912. Dictionary of National Biography. 2nd Supplement. Volume 2. Oxford, UK: Oxford University Press. Tisdall, William St. Clair, and William Muir. 1901. The sources of Islam: a Persian treatise. Edinburgh, UK: T. & T. Clark. Watt, W. Montgomery. 1961. Muḥammad: prophet and statesman. London, UK: Oxford University Press. ISBN 9780198810780. All links retrieved December 5, 2014. Books by Muir on a anti-Muslim polemical site. Books by Muir at the Internet Archive. Centre for South Asian Studies, Edinburgh. This page was last modified on 5 December 2014, at 17:57.